She's known as one of the world's most beautiful women, but the co-creator of Cindy Crawford Skin Care is much more than a pretty face. Crawford, the supermodel who once ruled the catwalk, now commands an entirely different runway: the skin care industry. It's no secret that flawless skin is as coveted as great hair, a perfect figure and a glamorous wardrobe. Though she's familiar with all of these seemingly unattainable things, even model Cindy Crawford can relate to the desire for perfect skin. Her busy schedule, involving long hours, frequent travel (including skin-unfriendly flights) and heavy makeup, started to take their toll on her skin. It wasn't long before she, too, sought an approach that would maintain her skin's radiance and slow the aging process. For help, Crawford turned to the man known as Europe's premier cosmetic doctor, Dr. Jean-Louis Sebagh. Treating celebrities, socialites, models and VIPs alike, Dr. Sebagh specializes in preserving the skin's vitality and vibrancy, without resorting to surgical methods. He calls his process "age maintenance." Using vitamin and antioxidant injections, Botox and collagen, Dr. Sebagh maintains a system of treatments formulated to fight free radicals and support collagen stimulation, thus plumping the skin, preventing wrinkles and eliminating existing fine lines. As a longtime client of Dr. Sebagh, Crawford had witnessed firsthand the dramatic results of the "age maintenance" process. As she began to explore opportunities to bottle and market an effective skin care solution that would address her needs, she thought immediately of Dr. Sebagh and the difference his system had made to her skin over the years. She contacted him, asking if it would be possible to actually bottle his formulas and ship them to her in America. Facing several challenges - namely bottling an ingredient that seemed nearly impossible to bottle at the time - Dr. Sebagh formulated and tested his products repeatedly until he was satisfied with the end result. After several years, the Cindy Crawford Skin Care line was born. They called it Meaningful Beauty. Meaningful Beauty was Crawford's skin care dream realized. She wanted to afford all women the opportunity to use and rely upon the system without worrying about concerns like cost and availability. Thus, she partnered with Guthy-Renker, a direct response television company specializing in product sales through cable, satellite and broadcast television outlets. The company also offers products through telemarketing, direct mail, the Internet and through retail outlets. Finally, Cindy Crawford Skin Care came to life, and the extensive age maintenance system was offered, without exclusivity and at a reasonable price, to women the world over. As one might expect from a company co-founded by a French doctor, Meaningful Beauty is quite the sophisticated treatment collection. It combines an elaborate formulation of unusual ingredients with the cutting edge of scientific findings. The result is an antioxidant-rich formula designed to reduce the signs of aging. The system's key ingredient is the powerful first generation antioxidant known as superoxide dismutase. Preliminary studies have suggested that this ingredient prevents the formation of free radicals, the unstable molecules of oxygen responsible for damaging skin cells. These free radicals cause the skin's collagen to break down, resulting in rigidity and brittleness. As the collagen layers collapse, fine lines and wrinkles begin to form. Most anti-aging products promise to rebuild these collagen layers, rejuvenate cells and diminish the production of free radical species. Dr. Sebagh discovered the prowess of superoxide dismutase when he learned of a scientific discovery of a rare French melon, the "cantaloupe charentais," grown exclusively in the south of France. While skeptics may find this a brow-raising claim, it was found that this melon stayed fresher and firmer for a longer period of time than other melons. The melon's longevity was attributed to superoxide dismutase. Working in harmony, these ingredients work to rejuvenate and restore the skin's radiance, all while acting as a force against aging skin. Skin Softening Cleanser: A non-irritating, creamy cleanser that is both oil- and fragrance-free. It gently removes makeup and impurities without stripping the skin of its natural moisture. Day Moisture SPF 8: In addition to the antioxidant, this daytime facial moisturizer also includes a botanical blend which provides hydration and protection from harmful UV rays. Safe to wear underneath makeup, it brightens and evens skin tone. Night Fluide: This light-textured formula works overnight to diminish the signs of aging, moisturize and revitalize. Eye Cream: This eye cream packs a punch, combating dark circles, fine lines and puffiness in one potent formula. Facial Masque: Ideal for refreshing and revitalizing the skin, this antioxidant and marine extract-rich concoction cleanses and purifies. Décolleté and Neck Cream: This oft-neglected area is pampered with an indulgent, rich cream that targets fine lines, resulting in smoother, more even skin. 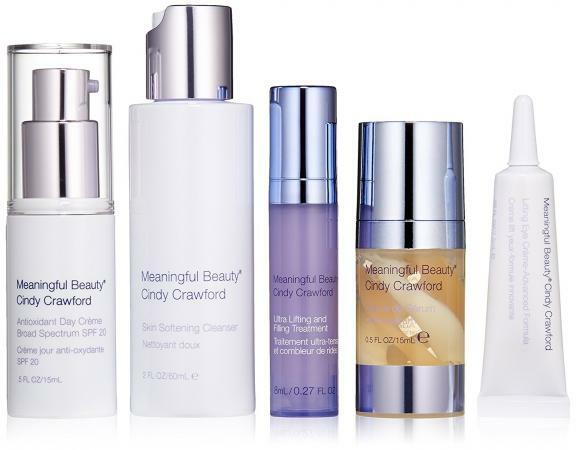 The Cindy Crawford Skin Care system is available exclusively at Meaningful Beauty.